What a section! 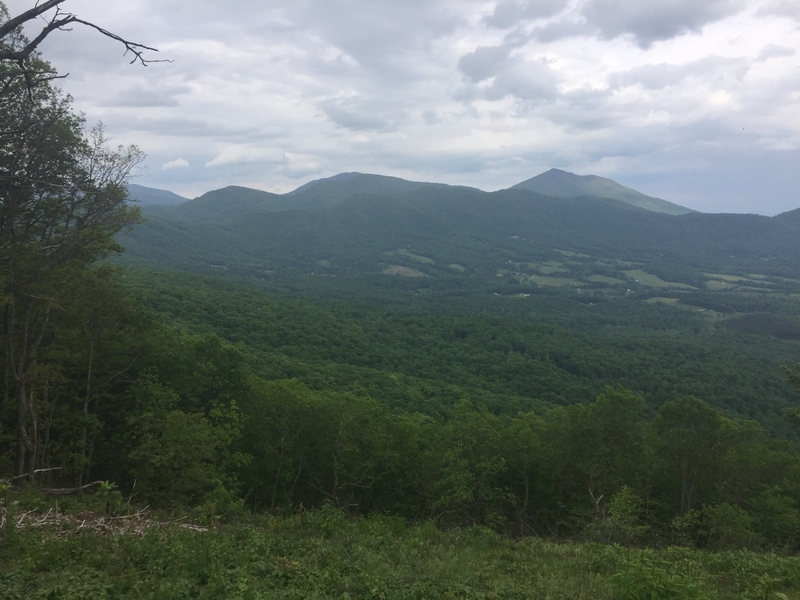 After leaving off in Pearisburg, I hiked the highly anticipated Dragon’s Tooth, Mcafee Knob, and Tinker Cliffs, got drenched while walking the first part of the Blue Ridge Parkway, and got bested by the Priest and Three Ridges Wilderness areas. 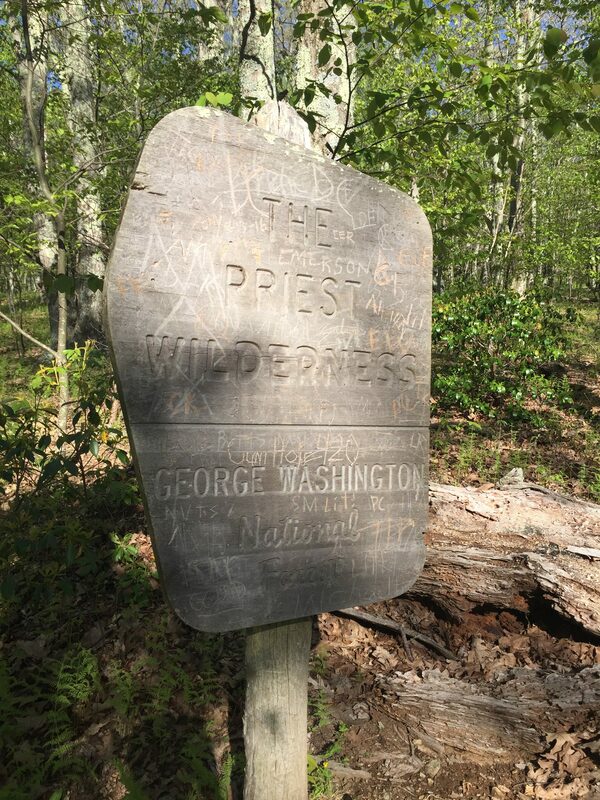 I left Pearisburg the day after Cinco de Mayo, a day that forced a zero on many unsuspecting thru hikers. 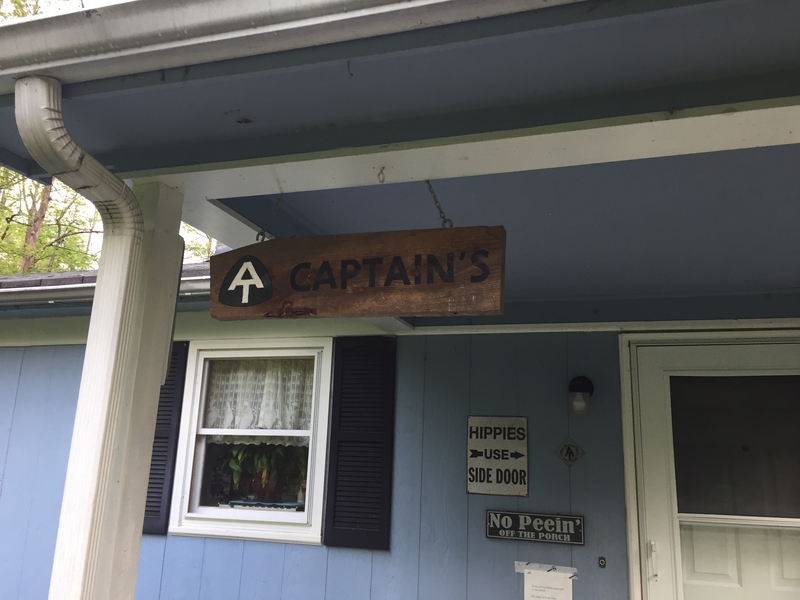 The destination for the day was a famous trail angel’s backyard: The Captain’s. The Captain lets thruhikers camp in his backyard and even provides sodas and a sauna. But the coolest thing about the Captain’s? ZIPLINE. Ok, so it’s more like a pulley system zipline, but I have been wishing for a zipline to transport me from point A to point B since Georgia. Even though it’s May, the temperature got down to the low 40s the next two days. Luckily, the hike had several great views in store to make up for the nippy weather. 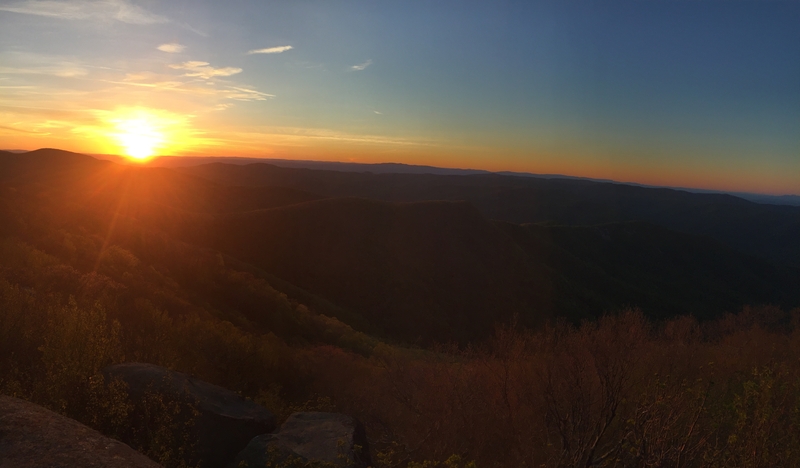 Kelly Knob proved to be a small teaser for the beauty that lay ahead. 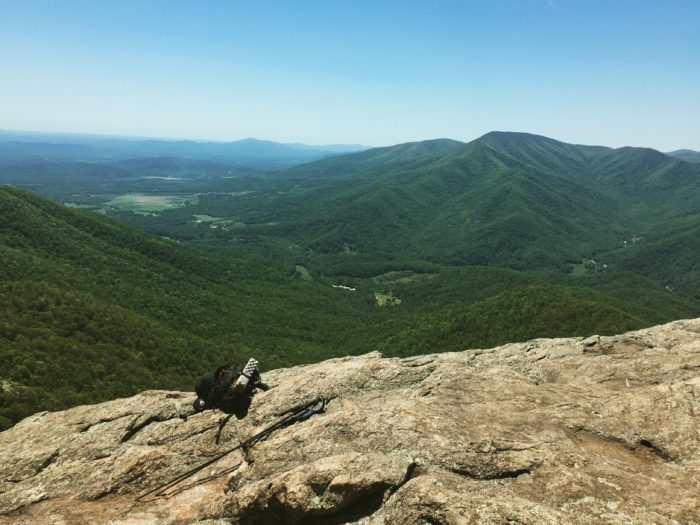 The section from the Dragon’s Tooth through Mcafee Knob and Tinker Cliffs is one of the most popular sections on the Appalachian Trail and with good reason. While the jagged rocks and countless cliffs test a hiker’s endurance, patience, and ankles, the trio makes up for it with stupendous views. Note: Never settle for a severely sloped campsite even if it means backtracking 0.1 miles to a flatter spot. You won’t sleep. 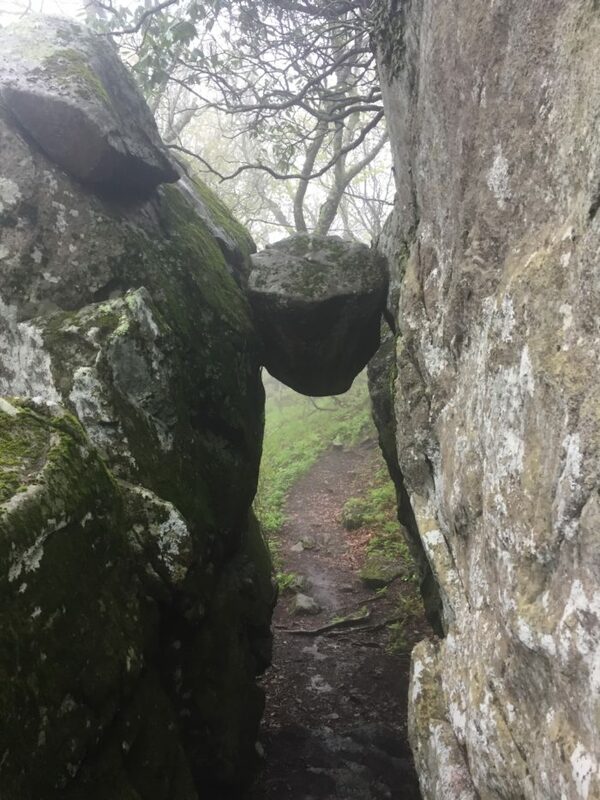 I woke up (ok more like rolled over from a sleepless night of sliding to edge of my tent) intent on making it to the Dragon’s Tooth, a huge stone monolith that resembles, well, a dragon’s tooth. The weather looked like it’d be turning sour the next two days and would potentially mean no views for the iconic AT section, so I pushed onward. I convinced Chiclet, a fellow thru-hiker I’d met way back in the Smokies, of my plan to make it to the Dragon’s Tooth and potentially camp there since I wanted to have good weather and great views for at least one of the there highlights. The plan, however, called for 24 miles of rough, rocky terrain. We made it just in time for an epic sunset. Chiclet went live on Facebook after we’d scrambled to the very top of the rock, risking live streaming his own death. The wind wasn’t quite howling, but it was forceful enough to make me chicken out from climbing to the tippy top of the monolith. Either way, the view at sunset was epic! Blue Steel, always ready for the photoshoot. Awesome night here! Due to the wind, we opted against camping on the ridge line, and decided to night hike to a campsite 0.7 miles away. My first night hike was treacherous. 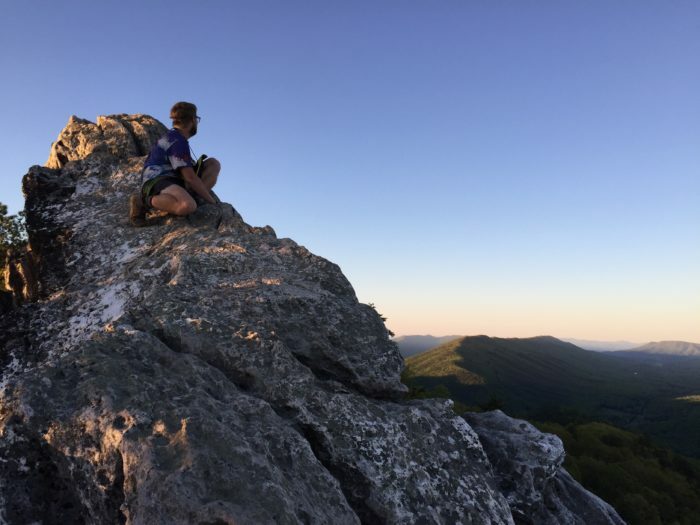 The descent from the dragons tooth is almost technical in places, requiring hand over hand scrambling and a lot of concentration and one of our friends, PopTart, had said he got turned around during the descent even when it was light out. We made it, but given a second go of it, I would’ve saved my first night hike for another, less treacherous, night. 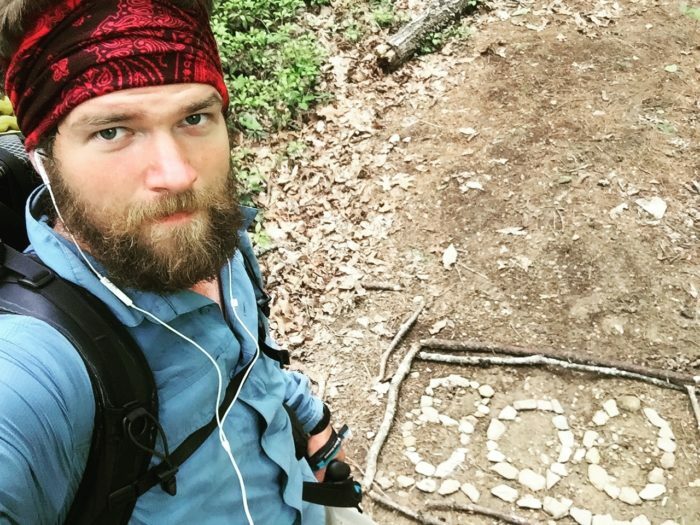 Mother Nature always has a say on the AT. 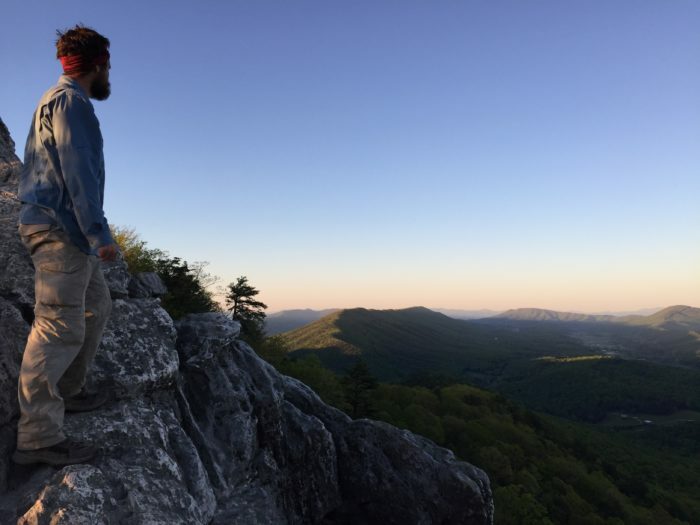 Since I’ve been looking forward to this section since I started planning my thru hike, I wanted to have good weather for Mcafee Knob and Tinker Cliffs (which are typically done in a day). The forecast, however, called for 3 days of rain. 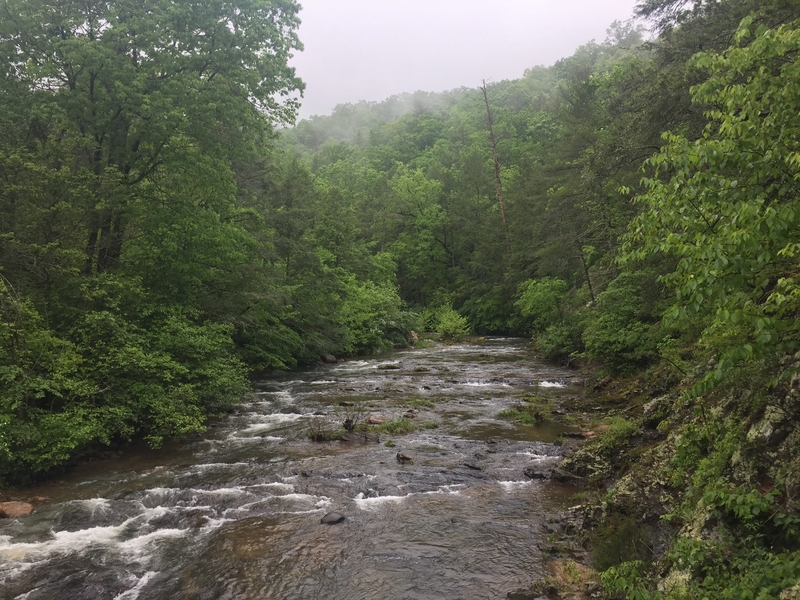 Luckily, it didn’t call for rain until 2pm, so Chiclet and I raced up the rocks all morning, barely beating the rain to the Knob and destroying our feet in the process. We even beat a trail runner to the Knob (pats self on back)! 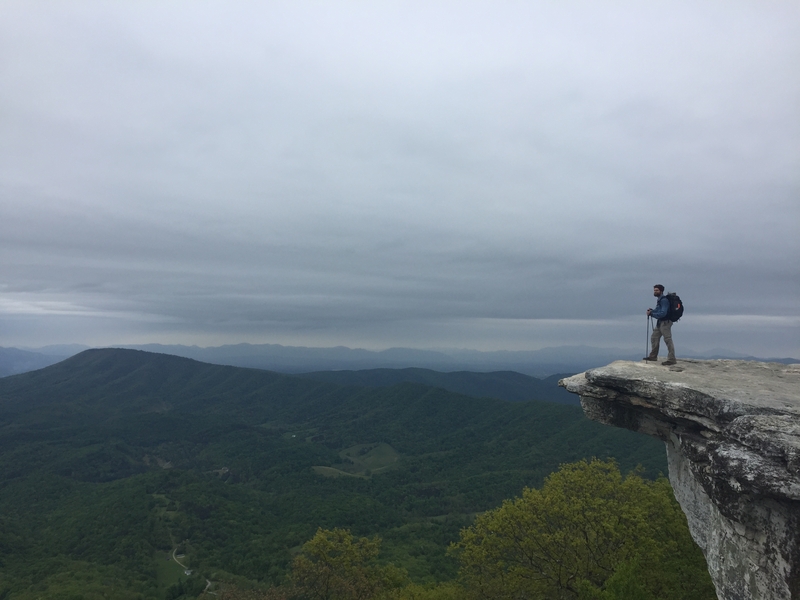 The views from both Mcafee Knob and Tinker Cliffs, though overcast, were everything I had hoped they would be! Huge views of Virginia rift lines and valley. I probably spent a good hour at the knob eating lunch and posing and then photographing others for the obligatory Mcafee Knob photo shoot. The obligatory Mcafee Knob shot, a vista that lives up to the hype! The trail walks the open Tinker Cliffs for about a quarter mile. A quarter mile that takes forever since you have to watch your step but can’t look away from the view! 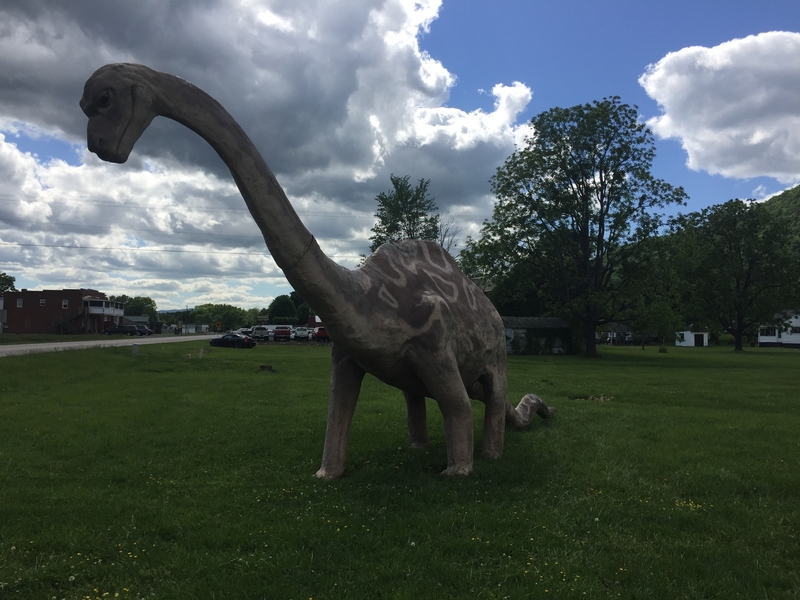 After a quick stop in Daleville, VA, I left Chiclet behind as he zeroed to avoid the rain. 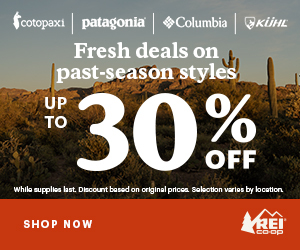 The next section of the trail crisscrosses the Blue Ridge Parkway in Virginia. 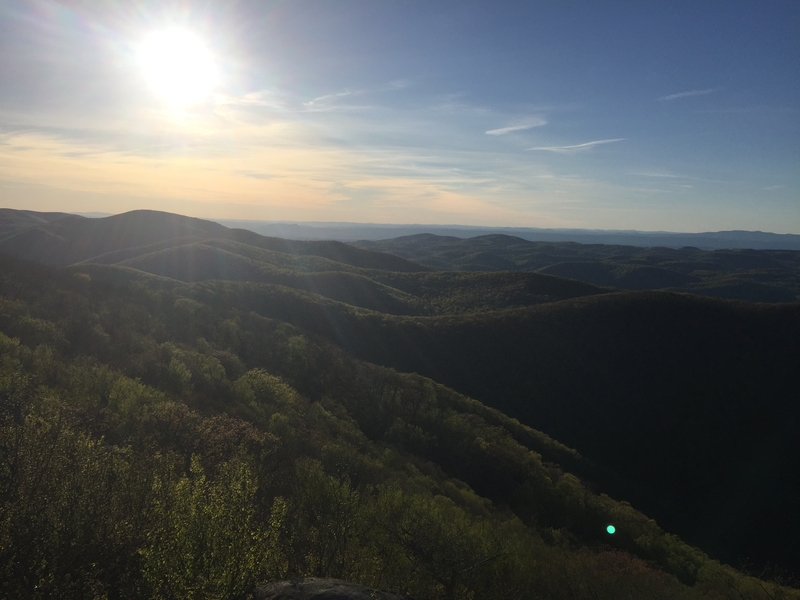 If you ever want to experience the views that the AT has to offer but don’t want to do any of the work, go for a drive on the Blue Ridge Parkway. Every other mile or so, I’d pop out of the woods to the road with a fantastic overlook of the Virginia hills, and there’d be cars with nice smelling tourists there to greet me. Unfortunately, the rain doesn’t hold out forever. I reached a shelter after 18 miles and thought I could make it the next one, 7 miles away, before the projected rainfall at 6pm. Boy, was I wrong. Not 30 minutes later and only 5 minutes into the rain, and I was soaked. I would remain soaked for the next two full days. While I had dry clothes to change into at night and made it to a shelter to sleep in, the days were absolutely miserable. The worst part of all is hanging your clothes overnight to dry only to have to put cold and wet clothes on right back in the morning. These two days were trying indeed for my mental patience. But, I still made progress, crossed under the Guillotine without losing my head, and was able to dry out every fiber of my being in Glasgow the third day. 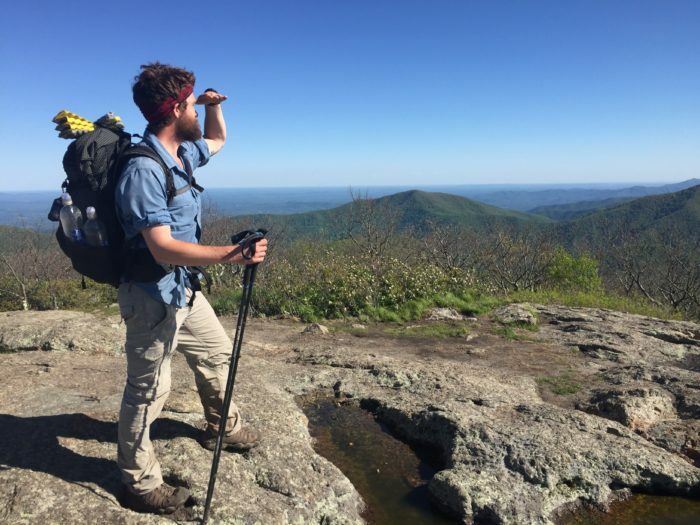 After the Mcafee knob section, AT hikers approach the Priest and Three Ridges Wilderness areas, a section known for its steep climbs and descents. After my experience climbing them both, they live up to their difficult reputation. It’s a thru hiker tradition to “confess your trail sins” at the Priest shelter, just below the summit of the Priest Mountain. The shelter’s log book is full of fun hiker confessions, ranging from the silly to the unrepentant to the adult. I, for one, confessed that transitioning from the fist bump (the thru hiker greeting of choice due to germs) back to handshakes when I re-enter the civilized world, will be really troubling. 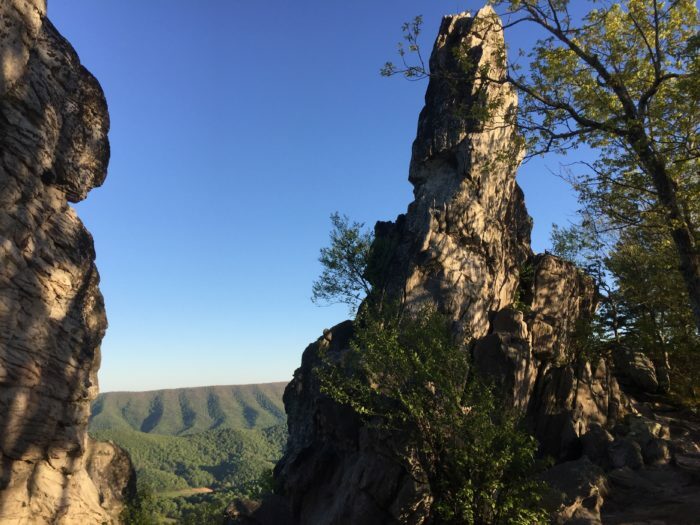 In addition to the campy confessions, Spy Rock and the summit of the Priest offer amazing views! While watching the sunset atop the priest and cooking dinner, the wind blew my pot lid down into the abyss between two ledges. Nooooo! 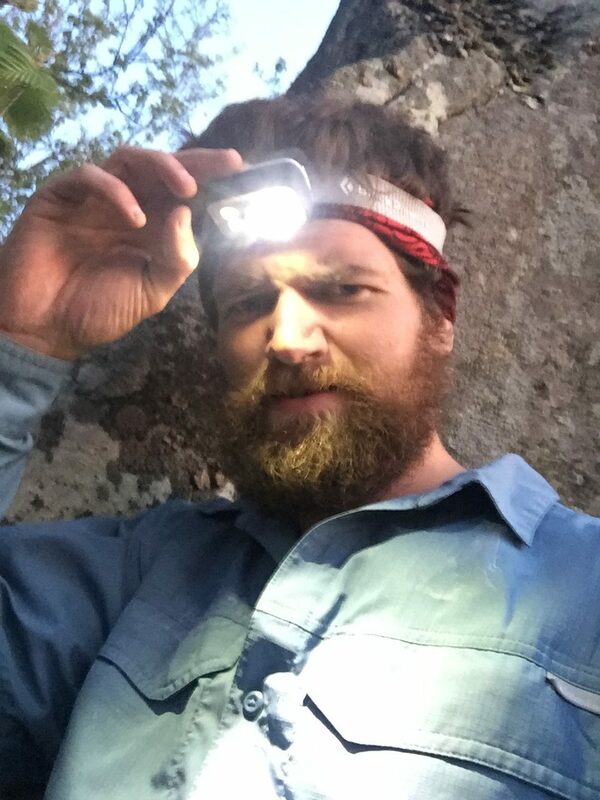 I’d chalked it up for lost forever BUT I grabbed my headlamp and decided if I shimmied down into the abyss, I just might be able to retrieve it. 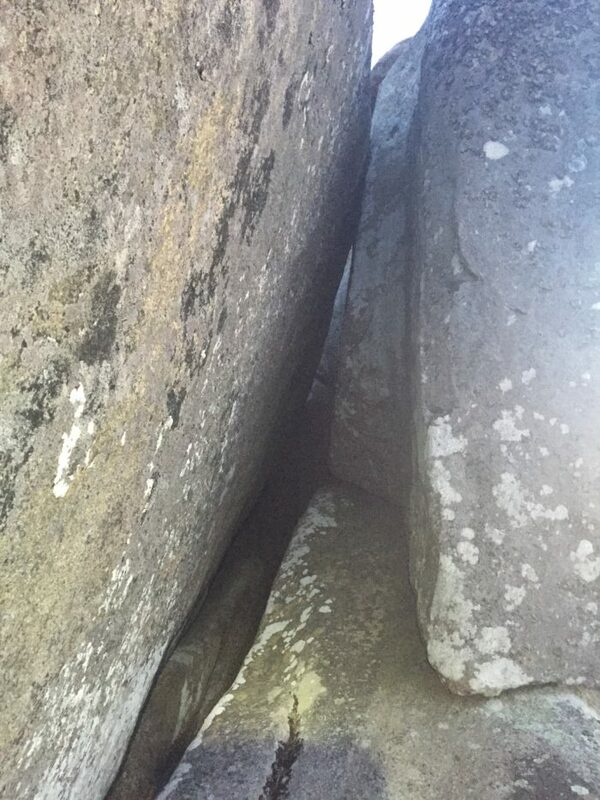 Two foot wide crevasse, 30 feet deep. No problem Blue Steel, you got this. Call me a caveman because that’s just what I did! Pot lid crisis averted. 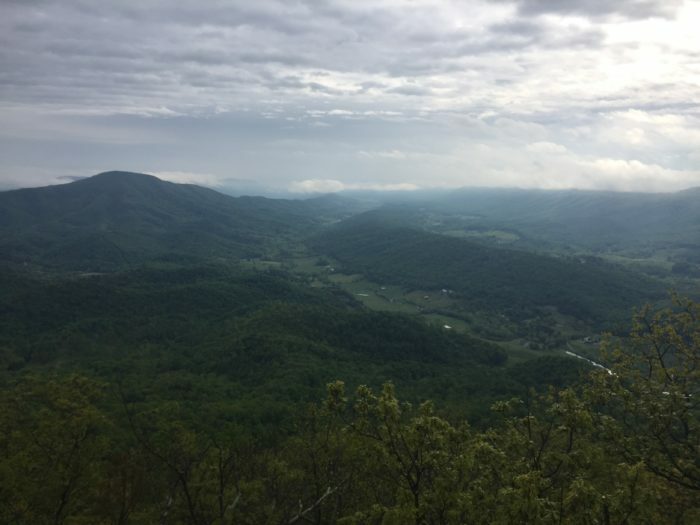 Three Ridges, which is really one huge, rocky climb, has got to be the toughest climb I’ve had in Virginia. 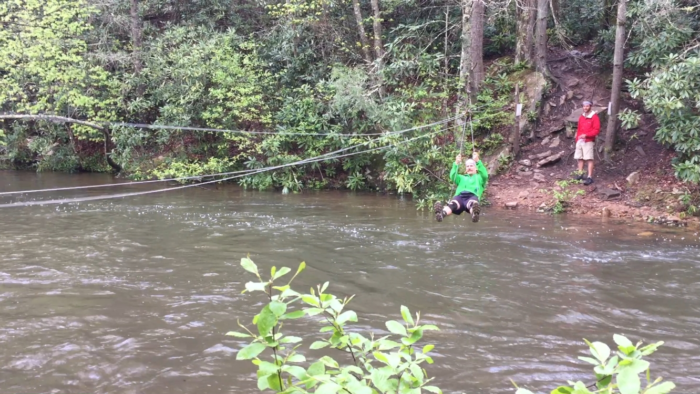 It’s over 3000′ of elevation gain, and super rocky. To top it off, the summit is wooded and offers absolutely no views. Once I finally conquered the beast and parted ways with the mountain with a few choice words, I had a great lunch view just below the summit where I stuffed my face with Nutella and cursed the Three Ridges. 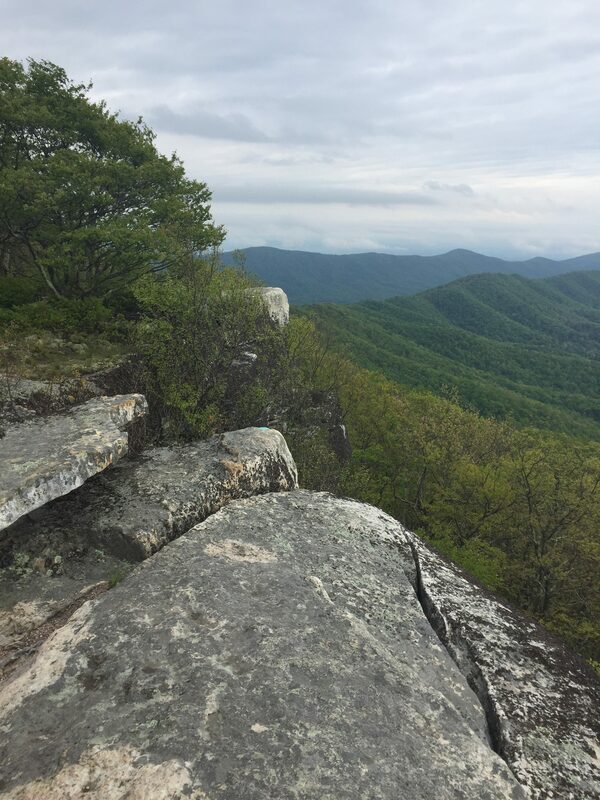 Virginia is beautiful and I’m looking forward to what Northern Virginia has to offer. -Why is there a dinosaur in Glasgow? -3 little Pigs BBQ in Daleville, where I had 3 meals in one sitting, was awesome! -New shoes make all the difference. After bumping up a size I can finally feel my big toes at the end of the day. -When 4 hikers split a hotel room, you can instantly smell the stench when you open the door. 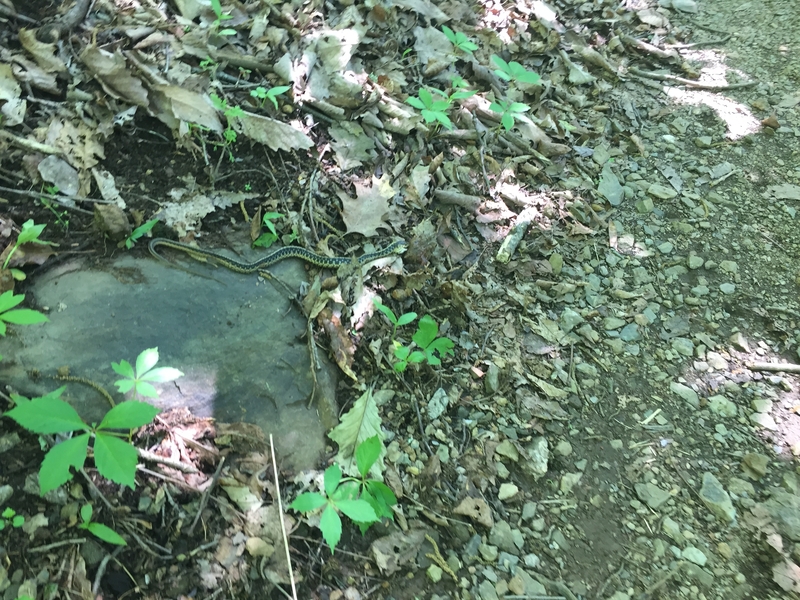 -How to react to the 3 snakes I’ve seen in this section: 1) curse/gasp like a little girl 2) jump way back 3) throw rocks and avoid avoid avoid. -How to react to a field mouse on your tent (luckily on the outer netting) at 1:30 AM: 1) Yell loudly in a frightened manner 2) Shake your tent violently to get it to leave 3) Stay up all night with paranoia. 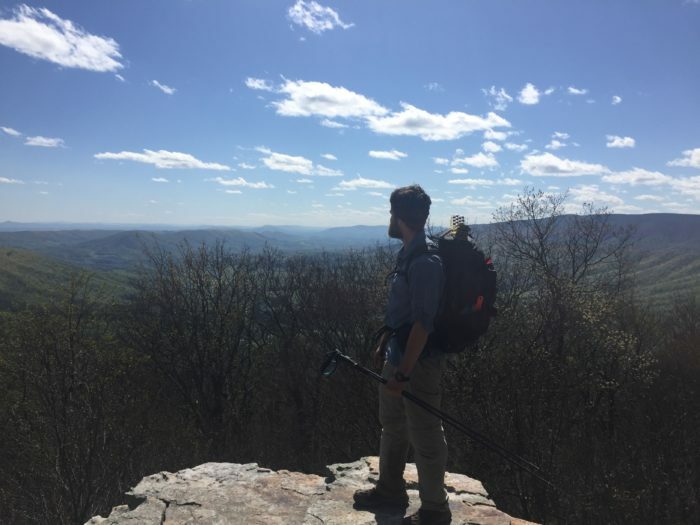 Next up is the Shenandoah National Park and the historic town of Harper’s Ferry, the (dare I say it) halfway town on the Appalachian Trail. Stay Tuned. It was great getting to meet you in Glasgow. My mom loved getting to do her first trail magic and you and the group helped to show her how safe and awesome thru hikers are. I look forward to following the rest of your journey. Happy Hiking! I just want to thank you again for bringing us the most unexpected trail magic ever!!! Seriously, showing up at a shelter was amazing! We may be a smelly group and look awfully homeless, but we st least try to be awesome, lol. Thanks again and good luck to your husband on the trail!